Looking for a Healing Codes Coach? There’s a simple path to healing any health, relationship or success issue—by healing the SOURCE of your issue with the latest healing and transformation techniques. Have you tried every healing approach—therapy, alternative medicine, conventional medicine, energy healing—yet STILL find healing elusive? Chances are, it’s because none of these approaches get at the SOURCE of all issues. It’s the unconscious negative images, unhealthy beliefs, and painful memories that are the true source of those stubborn issues you can’t seem to heal, no matter how hard you try. Did you get that? ALL the issues of life have the same source—the heart! Modern science tells us that these memories, images and beliefs are stored not only in the brain, but in every cell of your body. And if these memories carry a “negative charge,” they are sending stress signals into your cells. And that can lead to all kinds of problems. Estimates vary from 80-98% of illnesses are somehow related to stress. THAT’S why you haven’t been able to heal some of those stubborn issues—you haven’t been using the right tool to deal with the real problem! Now you CAN have the right tool, and know how to go to the right problem—and finally experience true healing of just about any health, relationship or success issue. Because when you heal the source, you finally, truly heal! 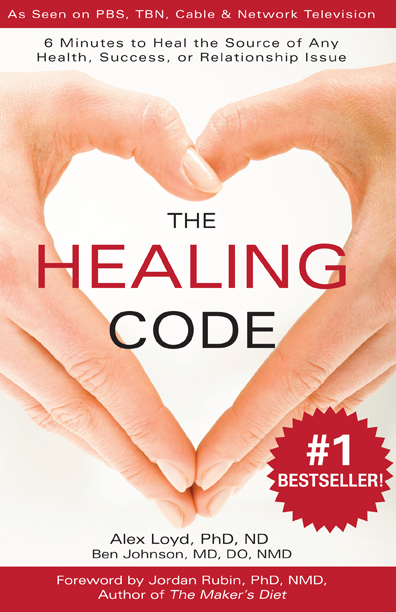 The Healing Codes are a powerful healing* mode discovered in 2001 by Alex Loyd after a 12-year search for relief for his wife's clinical depression. Not only did The Healing Codes heal his wife's depression in a matter of days ... as Alex Loyd used it with his other clients (he was working as a therapist), they began to report healing from MS, Lou Gehrig's, cancer, diabetes, and other illnesses. Alex Loyd spent the next year and a half researching what made this new healing mode work. Through Heart Rate Variability tests, Dr. Loyd verified that The Healing Codes remove stress in the autonomic nervous system. When such physiological stress is removed, the neuro-immune system does its work of healing the body. 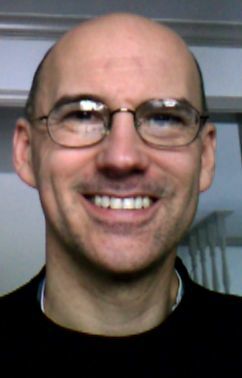 His discovery is outlined in his book, The Healing Code, for which I was the editor and publishing coach. Alex Loyd has since trained dozens of Healing Codes Coaches around the world to work with clients to develop individualized custom Healing Codes that target specific "issues of the heart," which are overlooked by most healing approaches. A growing body of research indicates that these "heart matters" may well be the true source of all health, relationship, and success/performance issues. The Healing Code in The Healing Code book is the "universal Healing Code" that works for most people for most issues. Many people report remarkable results from just using that Healing Code, which is based on 10 years of testing by Alex Loyd to determine that this Healing Code works for most people and most issues. The more specifically we can pinpoint your issue, and the more specific a Healing Code is to your issue, the faster--and deeper--the healing. I will also train you in the several "tweaks" I have developed, one of which is especially good if you are a Highly Sensitive Person. This one technique will release any negative energy that you may have taken on from others. Besides developing Custom Codes for your issue, I will also help you get the most out of using the Healing Codes and my other methods, so that you will confidently know how to use these powerful healing methods for the rest of your life. 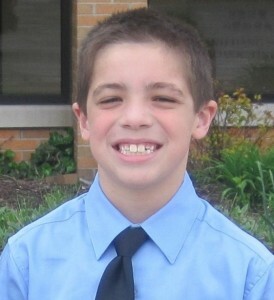 Listen to this 2-minute testimonial about Vinny, a boy who had an inoperable benign brain tumor. His grandmother faithfully did custom Healing Codes for him throughout his treatments. Here are the results, after 18 months of her and many others (via my Healing Hearts Prayer Circle) doing these Healing Codes. This story shows the power of doing custom Healing Codes for other people, as well as the power of combined intention. "It was such a relief that the evening after I did the custom code you gave me for my 11 year old son's insomnia, he fell asleep and slept through the night on that Wednesday, through the whole day Thursday (although I tried to awaken him, it was not possible) and through until late Friday morning. "After literally months of him not being able to fall asleep, trying to survive on 3-4 hours of poor sleep, and frequently waking my husband and me for help, he slept and has been sleeping normally since. "Thank you so much, it was a miracle for us!" Strabismus Corrected "Faster than Doctor Ever Experienced"
Heather Perry came to me in mid April, 2014 because of her concern for her 2 1/2 year-old son's eye that was turning in. I gave them custom Healing Codes every 2 weeks between April 18 and July 31. Click here to read the full story of Dalton's results and to better see the pictures that indicate that the Healing Codes work, AND that you can do them for other people and get great results. Note that the above examples are of people doing custom Healing Codes for another person. This is one of the most under-advertised advantages of this modality. People have also been amazed at the results they've experienced for themselves after getting their Custom Codes. Mary from Missouri said, "These custom codes pounce on the issue so fast!" "The code I received from you totally made a difference in my bulging disc pain. It was so large and painful surgery was recommended. That was a year ago now. Thankful for Healing Codes family and the genuine care I receive from you all. It actually melts resistence in me as I have difficulty trusting!!!" "I started smoking 59 years ago mostly to help me deal with depression. But I knew it wasn't good, and for the past 45 years I've tried countless times to quit. I could never quit for more than 2-3 weeks at a time and I was miserable. Numerous health problems that have come up more recently made me desperate to quit, so I called Diane for custom codes. "My friends cannot believe what's happened. Not only have I been able to go for 2 months without smoking, but it really hasn't bothered me. I've had a few rough times, but I'd just do the Code and the craving would be 95% gone. Also the depression is much, much better. "I've seen other physical issues improve as well, plus I have more patience. People and things that used to bother me a lot don't anymore. I think that Dr. Alex Loyd's discovery is an amazing gift to the world!" When you request your Custom Healing Code and return some necessary paperwork, I'll contact you to set up our time. I'll also send special instructions so we can make the most of our time. All coaching is done over the phone (can use Skype for international calls), and I will call you so you don't have to be concerned about long-distance charges. Allot up to 30 minutes for a regular coaching session, and 45-50 minutes for a Coach-Guided Custom Code. See below for further details. Good News! If you live outside of the United States or Canada, we can use Skype (or you can call me). The links below will take you to an order page, where you can use Paypal or a credit card. You may also send me a personal check. Email me () to get my mailing address and let me know your check is coming. There is no expiration in terms of when you can use a pre-paid custom code, but I do try to schedule your first session as soon as possible. I understand your issue is usually urgent. "I did therapy for 10 years to help resolve my emotional issues, specifically fear and anxiety, and I've seen more improvement in 4 days of doing [your custom] Healing Codes than I did in 10 years [of therapy]. If you don't already have The Healing Code book, you may also get a copy with one personal Custom Coaching session for only $84.95. You're essentially getting a Personal Coding session and the softcover book for free, with no shipping charges (US only)! *The Healing Codes do not treat, diagnose, or cure anything. By "healing" we mean that it will change the negative "charge" on the memories, images, and beliefs that we believe are the true source of health, relationship or success issues. I call these "issues of the heart" and this is ALL any Healing Code addresses. For the full Disclaimer, which all clients are required to sign before their Healing Codes session, click here.